Vons is a supermarket with a wide range of grocery, meat, seafood, deli-bakery, organic products, and special deals. Browse the Vons Weekly Ad regularly on this page to see deals like fab!5, just for u digital coupons, bonus offers, and rewards that are examples of discounts from Albertsons subsidiary store Vons. The Vons Ad can also be a source to shop with BOGO free products. High-quality, fresh, delicious meat products are frequently on sale with the Buy 1 Get 1 Free deal. Vons operates in Southern California and Southern Nevada. Currently, there are 325 Vons stores in these states. Their product range covers bakery, dairy, deli, frozen sale, liquor, floral sales, and many more. Safeway, Acme Markets, Vons, Tom Thumb, Rendalls, Jewel-Osco, and Vons are all subsidiaries of Albertsons. It’s naturally one of the biggest grocery retailers also with non-food categories in the United States. You can subscribe to Vons Ad here on this page. Fab!5 savings is one of the best deals from the latest Vons Ad. Albertsons Vons ad content covers $5/lb. club price deals of many fine products of different aisles. You can see the $5 Friday sale and digital coupons on the first page of the preview of the Ad. Jennie-O fresh 93% lean ground turkey will cost only $1.88/lb. this week. Strawberries, Lucerne Eggs, Coke, Pepsi, and more products are on sale. Take a look at the deli products on pg 3. Grab and go your favorite one to suppress your hunger during your way to work. Monopoly Bonus Ticket items can also be your options to save more. 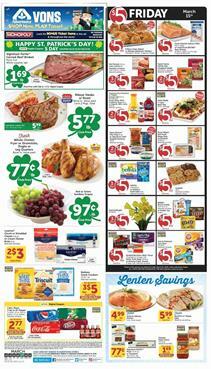 Mix or match sale products on pg 3. The Ad also shows some organic foods like pineapple, gala apples, cucumbers, rainbow carrots, on the last page.